Earn $2.51 in VIP credit (251 points)What's This? The Velo Wall Rack is a super sturdy wall mounted bicycle storage unit. 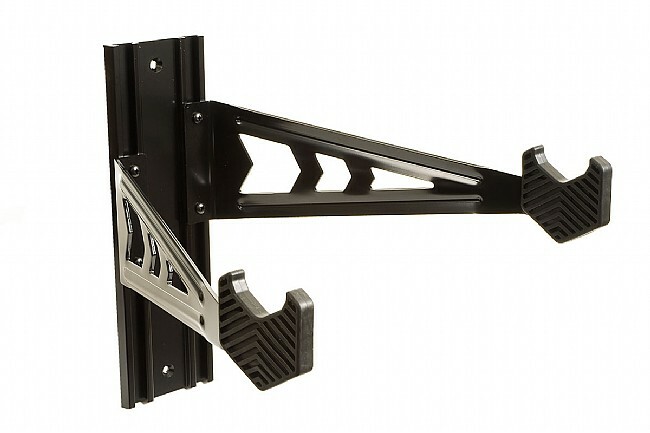 Feedback's unique design holds up to 70lbs and looks great in the garage or living room. A slotted aluminum bracket mounts to any wall stud using just two screws. The arms can then be independently adjusted from a level position to up to 8 inches apart for a perfect fit on almost any frame. Soft rubber coated cradles won't damage paint. Includes mounting hardware. Always a great deal and quick shipping from BikeTiresDirect. Use this on the wall in my bike / guest room. Holds my Felt 29er MTB that is about 28lbs with no issue. Easy to customize the arms to hold top tube any bike. It does just what I need it to for the Seina Litespeed. keeps the good bikes off the floor and out of the way to avoid any accidents. Well designed, sturdy, functional, easy to install and adjust for our road bikes. Helps keep garage organized for...the car. Easy to install. Love that it is adjustable for different frames. Perfect rack to get your bike off of the floor. Used to lean mine against the work bench in the garage, and it was always in the way. With this inexpensive option, my bike is up and out of the way. It also can be used as a limited version of a bike stand for minor repairs, but you have to make sure it is properly mounted on the wall. great purchase experience. well packaged, good product, etc. Our family has 6 bikes, so storage room in the garage has been an issue. I bought 2 of these and love how well they work. The arms adjust to any of the styles of bikes that I have put on them. They are very sturdy, and I have no fear that the bike is going to fall out of them. The only negative that I can find is that bikes with longer handlebars can hit the mounting wall. It will fit by turning the handlebars a little, but thought it was worth mentioning. Otherwise, a great product that is worth the money. Super strong mount. I am using to hang my wifes 35lbs bike with childseat on back. Handles the weight without any issues. Keeps the bike well balanced so it hangs straight. Would highly recommend for those looking to hang bike. I have one of those mountain bikes with a strange top tube and the way the velo wall rack adjusts works great for my bike! This allows my bike to be held close to the wall and perfectly level. Easy to install, adjustable & looks great in my apartment . I recently purchased a high end Trtek road bike that I wanted to keep in the house, as opposed to the garage. The Velo Wall Rack was the perfect solution for me - My new Trek is safely in the house in a second bedroom - And looks great as a wall decoration when I am not riding. The rack was easy to install and is easy to use. I used the Velo Wall Rack to display my vintage Bianchi in the den of my home. The rack was easy to install. Just drill a few holes and mount with the screws that were included with the rack. Rack is adjustable and very sturdy. The clean look, as compared to other versions that I looked at, helps keep the bike and not the rack as the focal point.